My lil’ guy hates wet diapers; actually, he just hates diapers. He LOVES to be naked all the time and personally, I think makes a game out of getting his clothes off! Regardless, this means I am changing his diaper ALL the time. The fact that he hates to be even the slightest bit wet, and the fact I know he’s wet (thanks to the handy blue pee line), makes me feel like I have to change him right away. We seriously go through roughly 10 diapers a day. And while I know I can let him sit in it a bit longer because of the ‘super new extra dry never know it’s wet’ technology (read chemicals) I can’t. My guilt takes over and I change him as soon as I know he’s soiled. Prior to having a baby I looked into cloth diapers. I expected to find the old prefolds that had to be pinned on and needed an extra large, super ‘plasticy’ cover over them. Having heard of only G Diapers at the time, I thought “at least the covers are cute; diapers sure have come a long way”. Not fully understanding that cloth had changed so dramatically, I still wanted to give it a try, pins and all. I started to look for a diaper service, believing they still existed….they don’t in my area, and came up empty handed. Being suuuuuper preggo, I decided to not worry about and went with disposables, telling myself plenty of people do, and it will be easier…. A few weeks ago I found myself driving to the local Target to get yet another box of diapers (they seem to have the best prices if you use double coupons and watch for sales), only to feel frustrated at the amount of money we were wasting on diapers. Not only that but the amount of money we were wasting on diaper genie special bags and diaper cream, AND all the time it took to remember to go to the store when we were low, and constantly emptying out the garbage can they were in, AND not to mentions all the waste we were putting into some landfill somewhere. So I drove to our closest cloth diaper store, which I had driven past a million times, Cutie Poops and Bottoms,and I was in awe. Cloth diapers had changed. DRAMATICALLY. I was happy to find such friendly and knowledgeable staff. I was sold instantly. This is what I needed, someone to explain the options to me. It made it much less overwhelming. They showed me all the different options, the prefolds, pockets, wraps, liners for poops!! !, and all sorts of “fun” things. I left that day with their diaper trial in hand. I got to try a variety of diapers for 3 weeks, and I could return them for all but $15 and store credit. Since they also sell adorable baby things, and have yoga classes and what not, I figured I could spend it on something even if I decided cloth wasn’t for me. But it was. I LOVE CLOTH DIAPERS. I’ll be the first to admit I still used disposables at night (I’m back to work full time so I haven’t been willing to ‘experiment’ in the middle of the night with potential leaks) but I’ll get there. I’ve been told one day, I’ll look and it’ll be my last disposable and I’ll be quite proud that I’m done, and no longer spending money on them. But I need my sleep if I have to catch a train to work as the sun comes up! Right now we’re using a variety of diapers, and I think I’ve got a pretty good system worked out. During the day when I’m at work we use FuzziBunz perfect size pockets, Happy Heiny one size pockets or Charlie Banana’s (that I ordered from Babies R Us). I haven’t decided which diaper is my favorite so far; but the people who watch my lil’ guy during the day are comfortable using the pockets, and I can just clean them when I get home. It’s a win-win there. When we go places on weekends, or its extra warm out, I’ve been using GroVia AIl in 2s with a fleece liner (that I made) to wick moisture away. It’s less to carry along, and seems ‘airy to me. The other diaper that I’m in LOVE with, and wish wasn’t so $$ but seems like it might be worth the price is IttiBitti. The fit is perfect on my lil’ guy. He doesn’t get the eczema on his thighs from them and in general it’s a much more absorbent, trimmer fit. So Hopefully I’ll get a few more of these over time and I will be able to use them more often (I only have 2 right now a Medium D’lish and a one size Tutto). 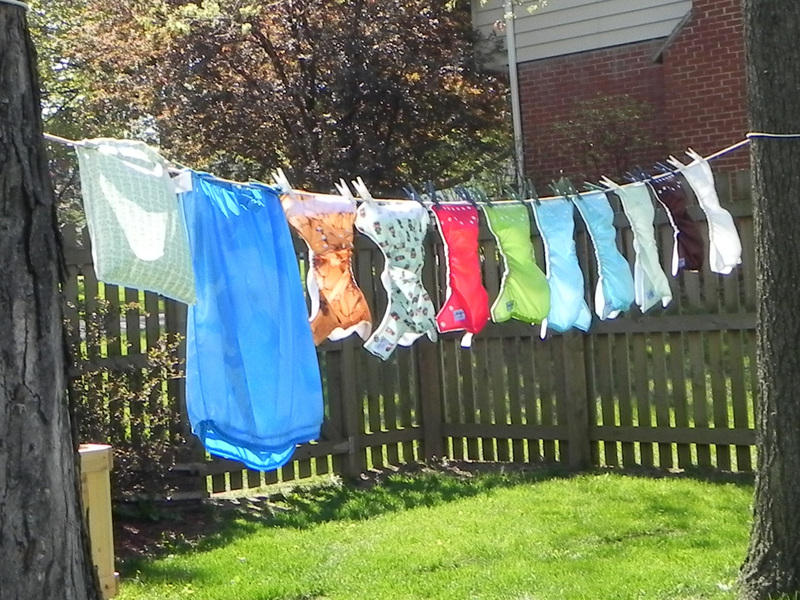 So all in all, I’m happy to be mainly cloth diapering. I’ll post detailed reviews soon. I found the blogs in combination with CutiePoops to be the most helpful in selecting diapers for my son. So good luck to those thinking of switching, and thanks to those with all the info who have been cloth diapering for years! Post your cloth diaper stories and suggestions in the comments! **Note, these are my honest opinions! I’m in now way affiliated with anyone mentioned in this post!